This week's #YourEduStory question is about what motivates learning. 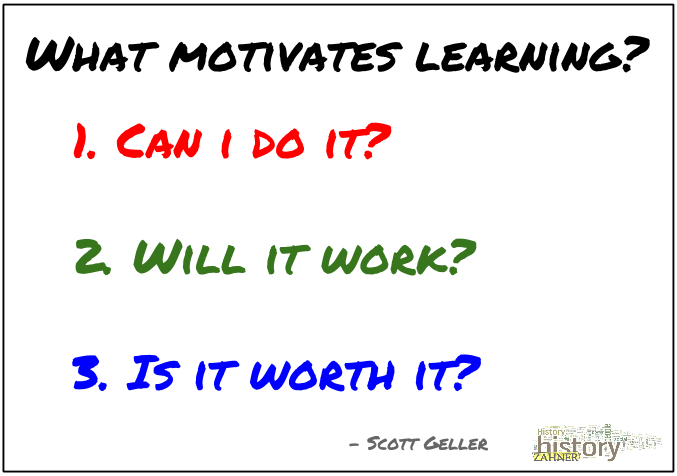 Motivating students to learn is one of the daily struggles for teachers. Alan November would argue that they struggle because they are still teaching the content as opposed to teaching them how to find content-related problems to solve, especially ones that interest them. But what goes on in our thought process when we are making a decision to learn something? Scott Geller, the director of the Center for Applied Behavior Systems in the Department of Psychology at Virginia Tech, says there are three questions that we face when becoming self-motivated. Geller also points out that these questions are supported by feedback and choice. Sound familiar? What I like most about his questions is the relevance to instruction. 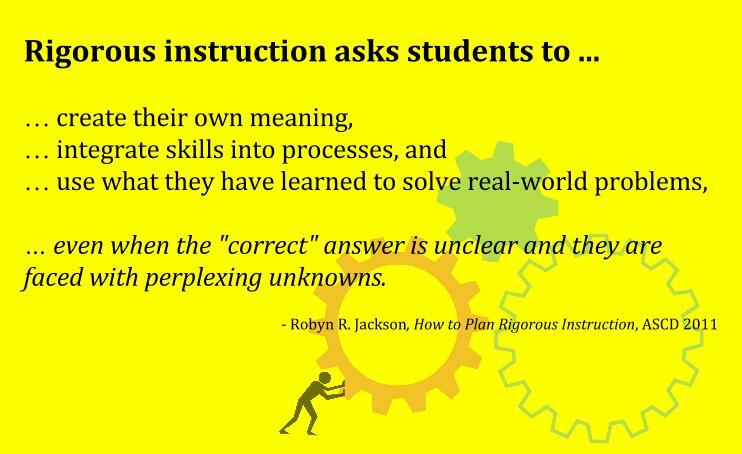 If teachers want students to be motivated to learn, they have to design learning experiences so students can answer "yes" to these three questions. Lately, I've been having students share images related to what we're learning. It all started when I answered a question by searching google images. Since my iPad is mirrored to the screen, my students were able to see how I search and evaluate results to find a suitable image to support my point. They looked at me like they wanted to try it, so I let them. Now, we upload images to a Google Drive folder instead of clicking through old slide presentations. 1. Can I do it? The reasons the image search works so well is because of the balance between limitation and choice. "Find an image that interests you and is related to the assigned topic." What kid doesn't want to do that instead of reading a textbook and answering questions? Or worse, listening to my bad jokes. When we discuss the images students drop into the folder, I ask two simple questions. (1) What do you see? (2) How do you know? or What makes you think that? This questioning strategy helps them merge analysis and evaluation with the feedback we share during our discussions. The more we go through this process, the better the images get. Students also have more ah-huh moments, and I don't have any classroom management issues. The most authentic feedback is simply based on how much we can learn through image analysis and discussion because of the image they chose. If we learn a lot, it worked. After each student experiences their image supporting the lesson, they feel more competent at choosing images for the lesson. They become contributors. Students want to contribute. They like to search, they like images. They also want an audience for their ideas. It's no wonder how much easier it is to get students to talk about what interested them in an image when it's the one they chose. When the image is relevant to the lesson, think about how easy it is for students to make connections if their interests are already called up. It's worth because it's better than the alternatives. These kinds of activities also open opportunities to make all kinds of products that demonstrate mastery. 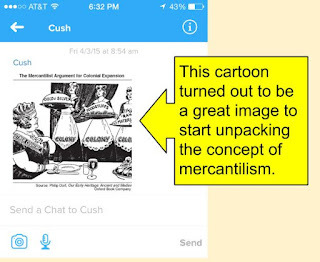 I gave my students a choice to make a slide presentation as a study aid for the Roaring Twenties or Quizlet decks. Without hesitation, they chose Quizlet. Then, I realized that it would be hard to collaborate and mentioned that Quizlet needs to figure out sharing work space like Google. A student in the back said, "Oh, we can do it, Mr. Zahner. We'll just combine the decks that each student makes." This is what happens when students have choices. They take control. What's better than that? 1. 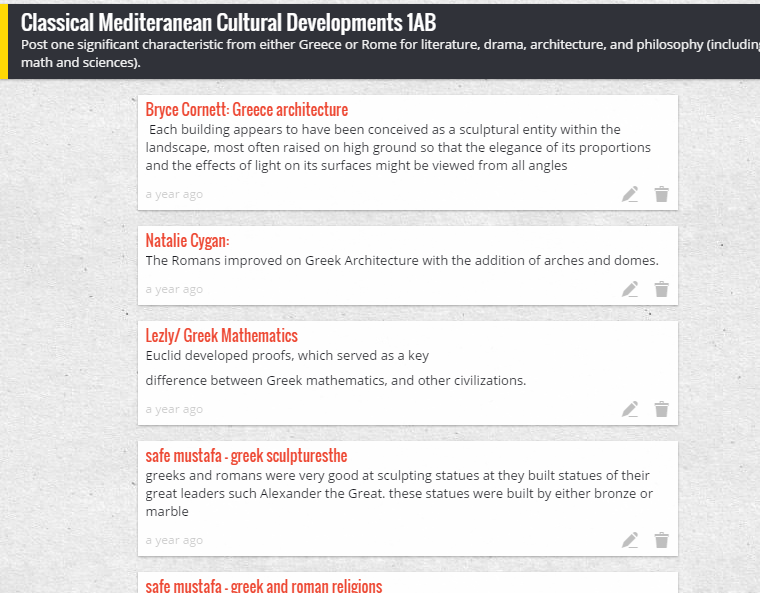 Group students and assign topics. I knew that there were five topics for the Roaring Twenties, so I had the students group into four or five each. 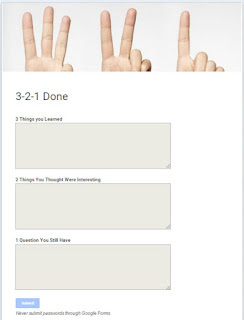 The topic outline (Google Doc) was on the screen and accessible through Google Classroom. This made it easier for students to follow along as I assigned groups topics and individual subtopics. 2. Students research their topics for keywords, vocabulary, and main ideas. At this point in the year, my students have practiced a variety of reading strategies, so determining the main ideas as they learn about their subtopics was not something that needed much support. I gave them a range of about three to five terms or keywords to use in their deck. The expectation was that the choices they made would help someone using the deck learn about the subtopics and how they relate to the topics and unit big ideas. 3. 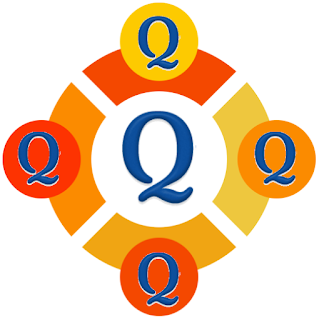 Quizlet decks are made based on the research results and include images. Once the students chose the terms for their decks, I reminded them to use the background they read to decide which auto-define suggestions are the strongest descriptions. A reasonable definition places the term in context and is no more than three lines (which is not always possible). This step exercises their evaluation skills and encourages them to refer back to their research to be sure of the accuracy of their choices. 4. Combine the decks to make one per group. Someone in each group had to combine the other group members' decks to make one deck. This was a good opportunity to reinforce the importance of using naming conventions. It could also help students become more responsible with their management of digital files on the front end of the project. I tell them that it's like writing a proper heading on paper-based work. 5. Make the group topic title on the review a link to the deck. 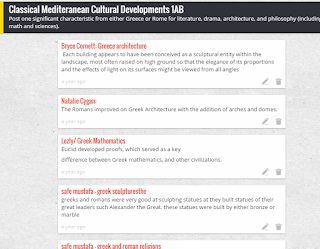 My favorite way to share resources with my students is through linked text on a Google Doc. It allows me to share the resources in the curriculum document or unit outline, for example. 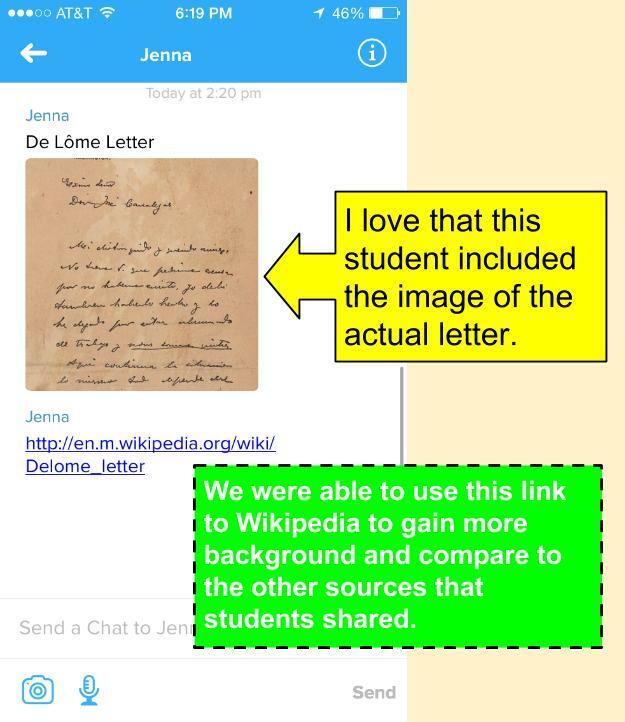 Teaching students to share via link is a skill they can take to other classes and beyond high school. Here's an example of a deck that one group made by combining their individual decks. Access the other decks on this Google Doc. As I nosed around the National Education Technology Plan webpage, the quote displayed (below) reminded me that it's April and that I needed to submit an update for a grant I received last year. 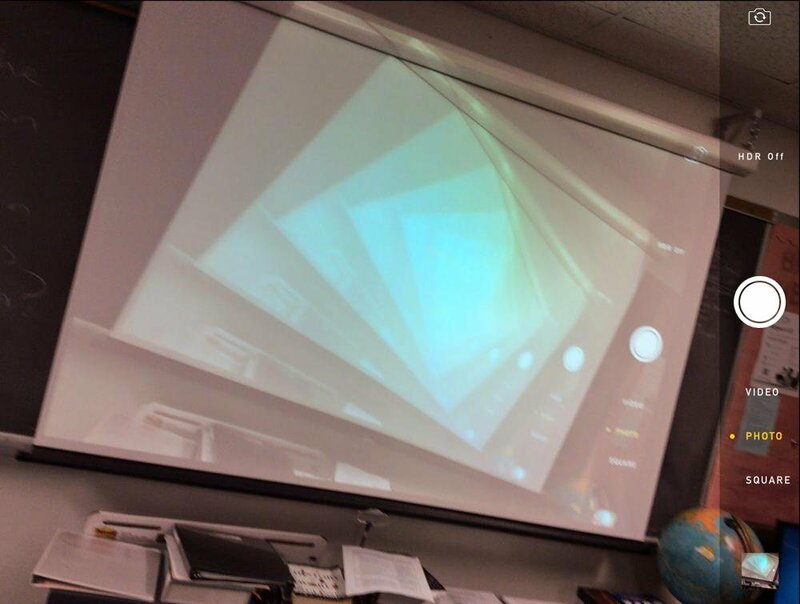 The project that received the grant was to help me mirror iPads to my projector screen. This was a hard grant to write because I was unsure of how to word the technical details without losing how it benefits kids. This quote from the Office of Educational Technology would have been perfect. The goal was to mirror my iPad to limit technology transition time and model acceptable use for students. This provided more opportunities for movement around the room and clarity on technology use expectations. But first, I needed to get the technology figured out. For the techies reading this post, the hard part was dealing with the fact that the Ethernet and WiFi were on two different subnets. For non-techies, this means the Internet in the air was not the same as the one in the wall. Since iPad mirroring only makes sense to do through WiFi (in the air), I had to get my computer to connect with the WiFi. I installed a driver for an 802.11n usb reciever to connect the PC to the WiFi. Then, I installed Air Server, a licensed software that was already available to every user in our district. Air Server processes the signal from the iPad to be displayed. The last step was to make my projector an extension of my monitor. This meant buying a cable and an adapter, which was a piece of cake. It eliminated a splitter box and something else that was in the way and made no sense. 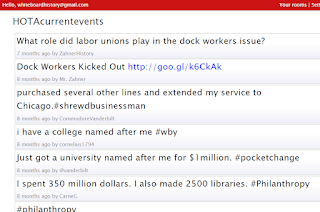 I guess this is the post that will let me know if any of the tech staff reads my blog. I'm not too worried, however. The results speak for themselves. It's safe to say that the goal was achieved immediately as students were engaged by the amount of web use we could incorporate into a lesson without stopping the conversation. Our use of search engines to find answers and pose new questions inspired my students to do the same. Now, when I ask a question, I have a few fact checkers on it right away. It's even better when I throw out vague numbers or date ranges and a hand goes up with the exact facts to enrich our discussion. I love how they set the record straight and feel comfortable correcting me. The biggest benefit of the mirroring project has been the intended outcome of students using their mobile devices for learning during classroom activities. The goal is to nurture a truly connected classroom. This means designing learning activities that mirror the ways we learn in our daily lives. With text messaging apps for learning like Chat by Remind and Google Drive for sharing files, the future of digital learning tools is a new kind of flip. It's more pervasive than lecturers giving videos for homework. This flip puts the learning in the hands of the students. I'm just the captain of the ship with a well-trained crew. It's National Poetry Month, so I wanted to share a few of the poetry styles I've been practicing with my history students. The power of this type of poem is in the variety of words students need to choose to complete the poem. In particular, the amount of verbs students have to write increases the action in their writing. If you think about it, it's the verbs that put the nouns to work and give ideas more context. 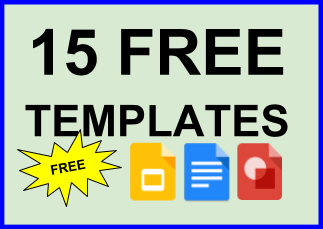 Look at the Google Drawing template for the types of words in each line. I learned about this on Read Think Write. These poems don't have to stop at one word for each letter. Consider how creativity explodes when limitations are placed on the process. For example, the one below includes full sentences with historical analysis, such as cause and effect and chronology or prioritization. Humans develop technology to migrate into different environments. Ice age environments change to allow for development of agriculture. States form out of the food and labor surpluses. Territories are defined and redefined because of economic and political differences. 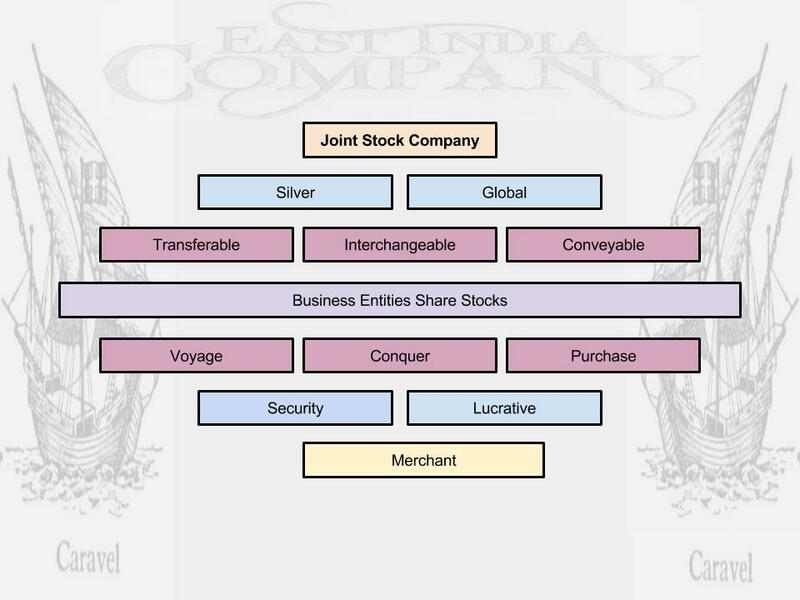 Oceans are traversed, connecting far away lands through trade and cultural beliefs. Revolutions in the way people produce and govern shape the modern eras. Youth learns about the past to understand the process of making choices to solve problems. H. W. Brands write a haiku about history every day or every other day and posts it to his Twitter feed and Facebook page. It's a creative way to use words to learn about history. Try giving each of your students a different issue related to the same topic. 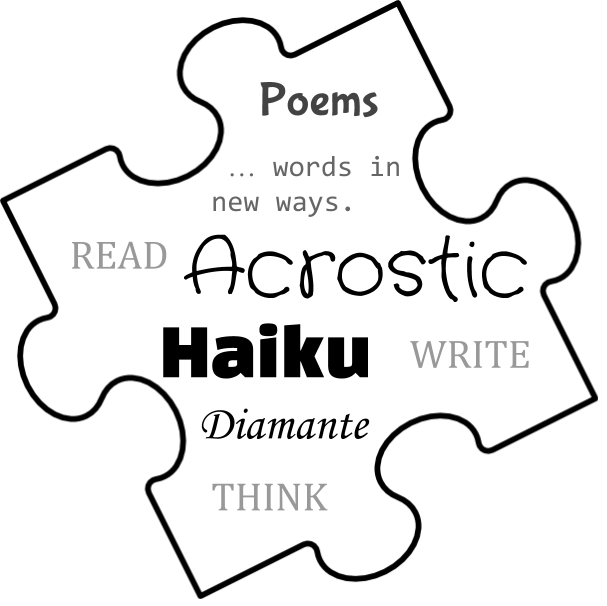 String the haiku poems together to make a class work to share with the school and online communities. I'm actually going to use Professor Brands' FDR court packing scheme haiku as part of an assessment. The poems could be matched to events or issues. 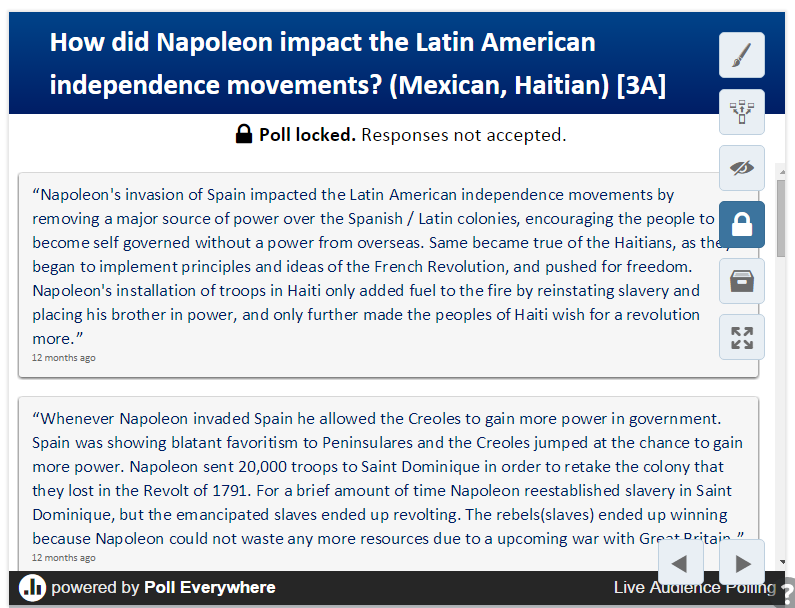 Students could choose one of a few options to write a few sentences explaining the historical relevance. This work came out of my attempt to come up with a mnemonic for the issues in the Early Modern Era 1450-1750. Then, my students took it to the next level, blowing my mind. It's an ongoing challenge to find the right balance between the students doing the heavy lifting and the teacher delivering prescribed content. It takes confidence to let go and risk the plan completely falling apart. The trick has been prompting student contributions in a variety of ways and filling in the gaps with direct answers or questions to dig for more. But the light bulb went off when I noticed Remind's new Chat tool was available on my app. I couldn't wait to try Chat because kids like communicating through text messages. 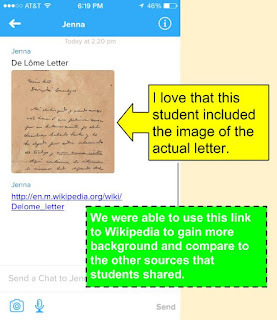 I was extra curious to see how they would take to texting images and other resources for a lesson, but I wasn't prepared for what happened next. 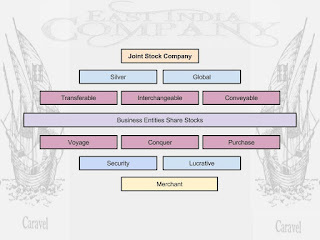 I asked my students to search "mercantilism" on Google Images and text me an image that sparks their interest. The Remind app was displayed on the big screen via my mirrored iPad. 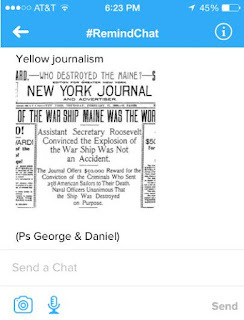 In about 45 seconds, I had a screenshot of a Wikipedia entry, a painting of a colonial harbor, a cartoon portraying the colony / mother country relationship, a variety of maps, a couple different graphic organizers, and a Family Guy meme that was actually a nice one-sentence summary. My eyes wide open, pacing back and forth in excitement, I realized that this simple task produced better content than the slide presentation that I had planned. It was a game changer. Now, the slide presentations I make can be produced with student contributions after the lesson. Click here for the slides I made from the Chat activity. Without being too specific, the students shared what they liked and the diversity of the class supported our need to analyze a variety of sources. What's more, this activity destroys ideas that there are too many standards in the curriculum because it addresses (don't say covers) at least five standards in one activity. After what I knew would be an easy quiz on the causes and effects of the Spanish-American War, I had my suspicions that students would score well without being able to explain certain events. Flubaroo only took a minute to mark the quizzes that were submitted through Google Forms, and just as I suspected, the class average was 14 out of 15. I asked the students if they knew the answers to a few but wouldn't be able to explain why. They immediately replied yes with almost a sigh of relief. No worries. I had them open the quiz again and search Google Images for a few of the trouble spots. 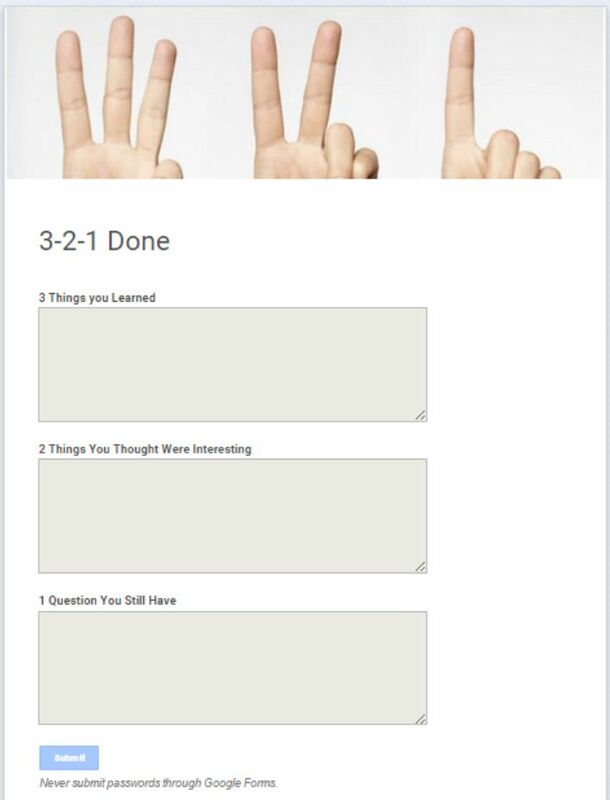 The room felt relaxed and confident as each student contribution was explained by the students sharing, and we ended the lesson cycle how we began – with Remind. The potential of #RemindChat is huge, so I'm curious to see how it plays out with some of the other activities we've done this year. I've been trying to incorporate a back channel discussion for a couple years. Until now, Today's Meet has been the winner. It has a character limit, like Twitter, so I'm wondering if Chat's lack of character limit appeals to my students. Come to think of it, using Chat is not really a backchannel because all of the texts go right to me. It's more like a pipeline, sending me content for class discussion in a format that some students prefer. And that's just what students did. As I asked questions and requested fact checking, the students' messages added content and clarity to our lesson without interruption of a speaker's thought. Chat will replace Today's Meet for current events homework. We'll probably still use Today's Meet to catalog the work because we can download the stream at the end of the year to PDF and publish our work history. We will also use it for exit tickets (3-2-1), reflecting on learning, and summarizing notes. Students can write a one-sentence summary, or more, and send it to me. 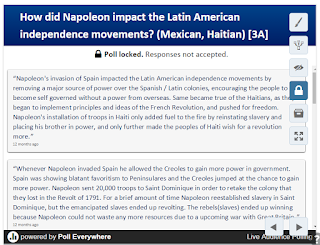 I can respond with feedback, and the summaries can be used as a review at the start of the next class. For classes that make collaborative notes on an application like Google Docs, this sort of activity is crucial because it's an individual formative assessment. The big idea that keeps me super excited about all of this is the ability to switch from prescriptive approach to content selection to student contributions. As I look into this crystal ball, I see ordinary educators sharing ideas about special topics like technology for reflection or struggles they experience establishing a connected classroom. Most importantly, I see lifelong learners who are making choices about how they wish to spend their time developing as professionals. If you could make your own conference for educators, what would it be like? Who would be there? This week's #YourEduStory is a fun post, so here's what I found in my magic hat. Conferences need three things to be effective: (1) Inspirational presenters, (2) Opportunities to connect with other professionals, (3) And takeaways – those ideas and tools that we can use the next day. There are other things that conferences need, of course, but these are the must haves for learning and developing. Oh, by the way ... it's a connected educators conference, but all are welcome. In the past several years, I've listened to a lot of keynote speakers. Most of them deserved the audience before them, but only a few continue to make me think. I'm not sure that the presenters who have inspired ongoing reflection are only of the published or Twitter star variety. They've just had substance, which is often provided through examples of student work. I like presenters like Alan November and George Couros because they share video, blogs, or Tweets that show what kids are doing in classrooms around the world. Anyone who can share work samples like they do will convince the audience of the relevance of their talk. I want to see what it looks like when it works and that it doesn't always work. I also like presenters who understand that the novelty of innovation can be troublesome if it is not accompanied by careful observation, reflection, and conversations with other professionals. We are almost to the point that every school will have at least one class that is working with a class or group outside of the campus. One of the best ways to make a global learning community is at a conference. Meet someone in person and connect on social media so the conversation about learning can be extended to the students. Perhaps the conference has a hashtag for general Tweets. It could also host caucus chats. These chats would take up some of the time people spend transitioning from one session to another. How about connecting with vendors? This conference I am pulling out of my magic hat has vendors who work to connect educators in creative ways like @RemindHQ's coffee chat sessions. The role of the vendor, in this case, is to facilitate a conversation, not sell products.if the products are so great, they'll sell themselves. Oh, that's another thing. A Remind group is essential for the conference. You can stay up to date on announcements and chat with other attendees. It's also a great way for presenters to crowd source images and sites for a truly learner-centered presentation. Everyone likes things and ideas that they can use right away. Since this conference is about learning technologies, there will be a focus on learning and strategies that are facilitated by a variety of technologies, which do not have to be defined by digital tools, alone. My takeaway will be new ways to engage students in critical thinking activities facilitated by tools and configurations that enable learners to share information, resources, and their work efficiently. We already have a lot of these tools, so most of what I will take away will be how to use them in lessons. What would you want at a conference? Please comment. I'm curious. Educators don't have to stop saying these words, but they need to think about whether or not they are using them to hide arguments that lack substance. Here are a few thoughts on how to strengthen the conversation. You might agree that we don't need some of them. This one is the worst offender on the list. Please don't cover anything. It will be hard to see, which is exactly what happens when teachers "cover the material." What if we think about content that is uncovered by the students. I guess if you take it too literally, like I do, you might see the problem. Not only is this word misunderstood, it's a terrible way to describe activities that require students to think about what they need to do next to solve problems. Prove me wrong. In the next year, keep track of how many classroom teachers who plan "rigorous" activities use this word to describe what their students are doing. I bet you'll develop an aversion to hearing administrators say it. I bet the truly rigorous lessons are not thought of that way. They probably just include teachers coaching students on how to solve problems in lieu of the teacher giving away answers. Not a great word for schools these days. What was wrong with objective? Did someone think that changing the word would change the culture. And by the way, posting a question based on the standard is far more effective for learning. What's more, the posted objective is easier for administrators to notice without interrupting, so whatever data is used to support posting objectives is clouded by the fact that it is easy for admin to check on teachers. This ensures that teachers are thinking about and using learning objectives. That's what leads to more learning, not posting it for students. This is the only word that I wouldn't mind taking off the list. It's not troublesome like the other words. Perhaps the only thing that bothers me is the lack of specific examples used to accompany use of the word. How else are educators going to develop a collective context for teaching and learning? Everything humans make to facilitate completing tasks is technology. Language is technology. Pencils and paper are very important technology. Perhaps if we train more teachers on how to use "technology," they would understand the pedagogy that goes well with each digital tool. That's what we'll call it all, "tools." Who wants to work at home? I do work (or learning) at home, but it's the kind of work that I like to do, which is mostly reading, discussing issues on Twitter, and looking up answers to my questions. The word "homework" is not going away, but we need to rethink how our parents and students think about it. We can start by not assigning the same homework for everyone. The homework assignment should be based on assessment results and it doesn't need to be mandatory unless the student needs more practice to support their own learning process. Enrichment is not required for graduation. I guess I'm glad these courses are not tied to graduation because they would be overemphasized and ruined by the pressure students would feel to succeed. They have enough of that. But what if all classes were like enrichment? Usually these classes include less stress on the part of the teacher that gets transferred to the students. Yes, this happens. What can teachers of core classes do to make learning more like enrichment? 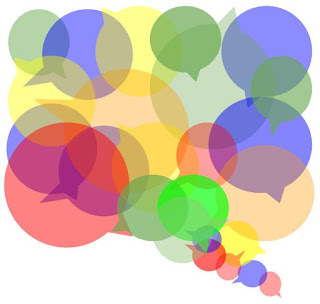 You can help move the conversation forward with your comments. Exit tickets are important for reflecting on learning and provide valuable information about student achievement. "I used to think ... But now I think." These exit tickets, and others, can be completed on paper or tools like the following five. Forms are easy to make and visually appealing. If all of your students have access to a computer or smart device, Forms can be a reliable exit ticket tool, especially if your school uses Google Apps for Education. 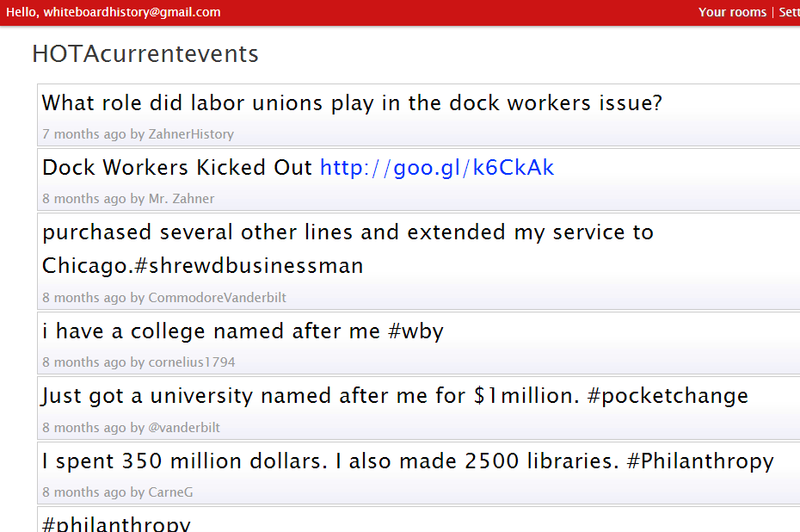 The strength of Poll Everywhere is in the wide range of devices that can be used to submit responses. If a student only has a non-smartphone, Poll Everywhere can still receive a response through text messaging (SMS). Presentation formats are also a strength. For text response, teachers can set the responses to scroll automatically at any speed, present a tiled arrangement, download a CSV for records, share a link to the responses, or present the responses in a word cloud. The word cloud is a quick way to get a feel for the class's concerns. This is my new favorite, and I actually use it more during class than after hours. Students with the Remind app on their smart device can send text messages, images, links, and voice recordings. If your students are taking notes, they can send a one-sentence summary to synthesize their work. But changed it up. 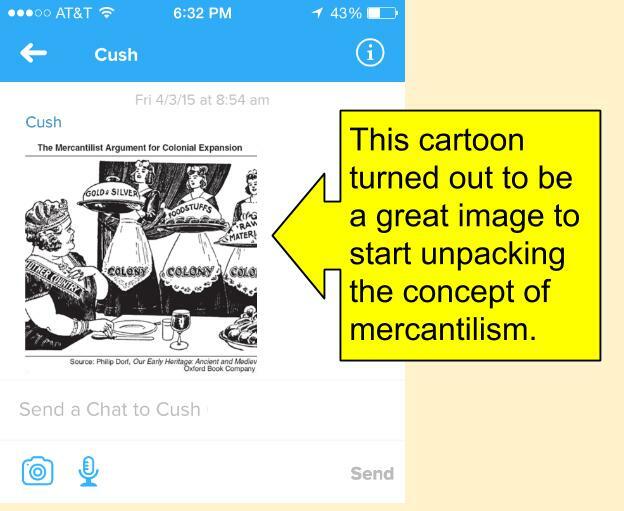 Tell your students to search for an image that summarizes what they learned and have them send it to you through Chat. It's a great way to start the next class. The character limit can be a blessing in disguise. At first, my students and I didn't like it, but then I noticed that it forced them to be more creative and think about their word choice. Today's Meet works well on any device that can access the internet through a web browser. It includes a projector view, PDF transcript, short link, and can be embedded in a site or blog for long term use or presentation. The image on the right is of a current events exit ticket. 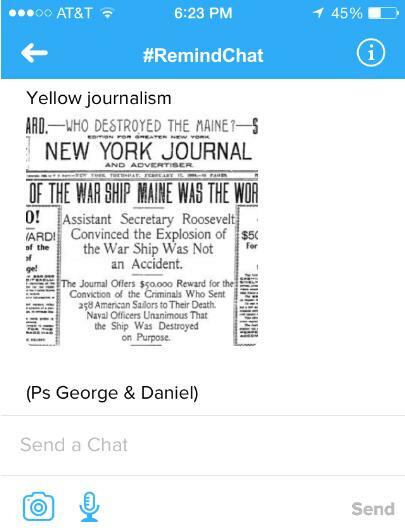 If your students need to share images, links, and text, Padlet is nice because you can share the walls by custom link or embed. You can also customize the wall in a variety of ways such as adding an image. Perhaps your students are summarizing a land form and posting it on a map of a region. The area in which they post their summary can correlate to the physical feature they studied. Now, the teacher has a resource to discuss in lieu of a prescriptive presentation. Play with these tools. You'll find that they all have strengths. It just depends on your goal and your students. My students work best with Remind Chat, Google Forms, and Today's Meet.